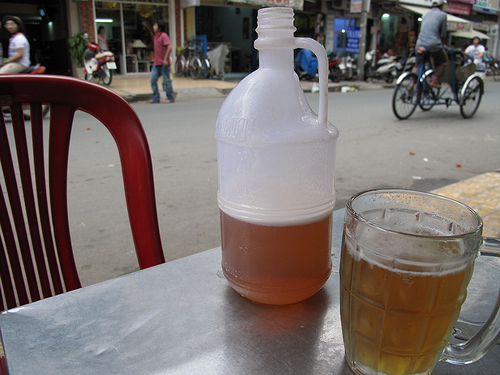 When I visited Vietnam in 2008, I quaffed my fair share of bia hoi and sat on many a tiny plastic chair with the locals. One of my favorite Vietnam memories, though, was walking through Hoi An, a small, ancient town in central Vietnam, after dark. Mrs. Brue and I had just enjoyed an outstanding meal on the banks of the mighty Thu Bon River and were weaving through town on our way back toward China Beach. There are virtually no cars in Hoi An, nor electrical lighting or pavement, which culminates in a truly amazing feeling of what the place must have been like to live in South East Asia centuries ago. Imagine an ocean of bicycles and people barely illuminated by lanterns. To complete the setting hung a dense fog that seemed to cling to what little illumination there was like a translucent blanket. As we strolled, we came upon a beer stall packed with locals… as well as two of our traveling companions bartering to purchase ALL of the beer for sale. For about $10 the proprietor loaded what must have been four cases worth into decaying plastic bags and sent us on our way as amazed customers looked on. The brews were enjoyed around a bonfire later that night. Just perfect. In many ways, Bio Hoi may be the world’s best session beer. Light, low ABV, and imminently affordable. You literally could drink it all day and show up for work the following morning little worse for the wear. Posted in Brews in the News. Fantastic article, Sudsy. We get caught up sometimes in the over complex world of craft brewing and forget about these local institutions that push out a product for the masses that help define the culture. It’s funny that I dream of sitting at a place like this in Vietnam, yet if I came across a cafe in the States that tried to push something like this on me I’d be appalled. I won’t drink a Bud Light, something that’s made my real-life Scientists because I perceive it as low quality, yet I wouldn’t hesitate to drink up some Hoi. I don’t think I’m alone in my way of thinking.